Super Smash Bros. is back, and it is as fun (even if its a little bit predictable) as ever with Super Smash Bros. Ultimate. During E3 2018, I was lucky enough to get a time slot in the For Glory competition. While I only survived for one two-round match, I was able to try out both newcomers Inkling and Ridley, and I was quite pleased with what I found. Super Smash Bros. Ultimate is exactly as it sounds- every character, ever, is for you to play as and battle it out. That means that if you like Snake, you can play as him. If for some reason you hate yourself and liked to play as Pichu (who comes complete with low-damage electrical moves that also damage yourself), you can. In addition, a huge number of stages from every prior game are now available here as well to select from in Super Smash Bros. Ultimate. 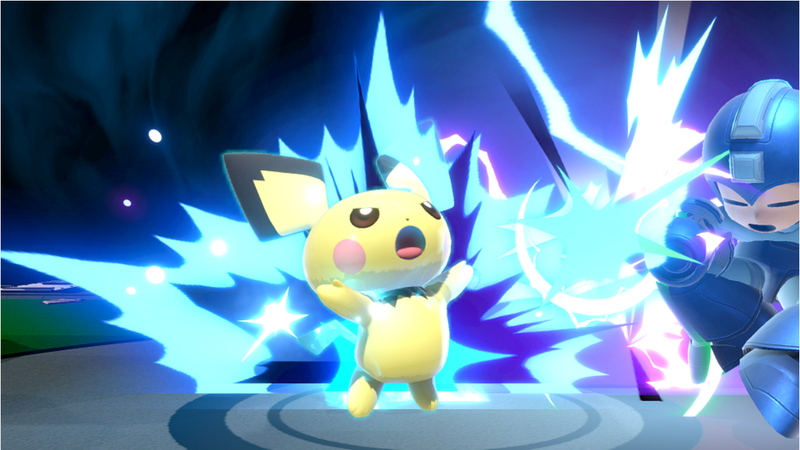 Everyone from fan-favorites Snake and Ice Climbers to fan-less favorite Pichu is back in Super Smash Bros. Ultimate! (Images courtesy of Nintendo). The first fighter I fought as in Super Smash Bros. Ultimate was Ridley, and I convinced everyone to play on the new Legend of Zelda: Breath of the Wild Great Plateau Tower stage. I found Ridley to be a large, powerful, somewhat slowish (but still faster than Mewtwo or Ganandorf from Super Smash Bros. Melee) character to use. I absolutely tore apart several characters that I was fighting against with Ridley’s physical attacks, and I was able to get to use his Ultimate Smash attack that flung a fighter against Samus’ ship. I was impressed with how viable of a fighter Ridley is, and that I was able to hold my own against some of the quicker, more classic characters. In short, Nintendo pulled off a fun version of a character that many people (not including our own Editor-In-Chief Josh Speer, who convincingly argued that “Ridley could, and should, be a playable character in the next Smash Bros.” back in 2014) predicted could never be successfully done. 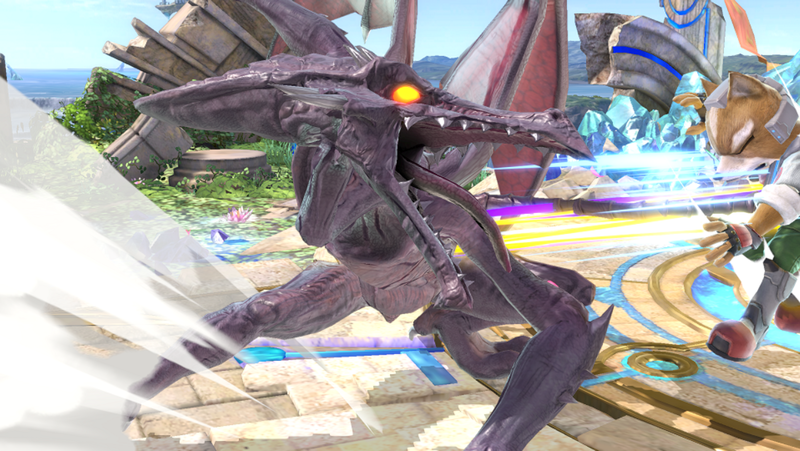 One of the newcomers to the franchise is Ridley, from the Metroid series. (Image courtesy of Nintendo). The second fighter I tried in Super Smash Bros. Ultimate was Inkling. 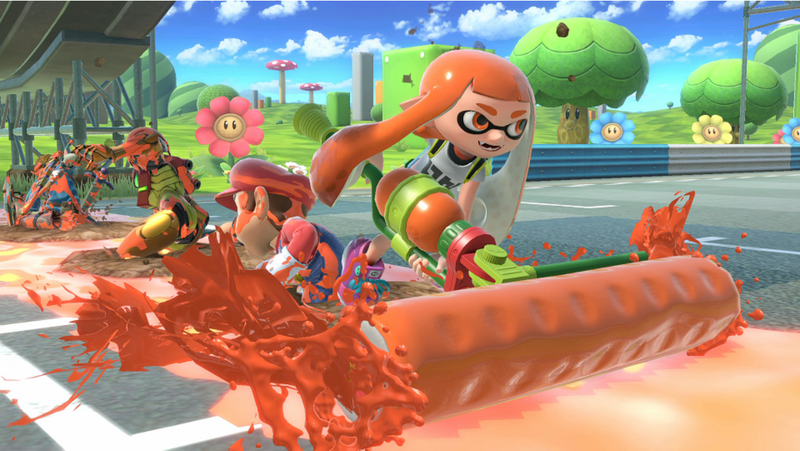 Inklings are a tactical fighter- in order to do decent damage, you have to first soak your opponent in ink. This ink is managed both by an ink meter that depletes when you spray ink (or use an ink bomb, which is the down special move), and you can refill by changing into squid mode and disappearing into the ink. I (admittedly again) hijacked the stage select and took us to Moray Towers to try Inklings out. There, I found that the character is a bit complex to actually play, but is a character that moves very, very fast and was able to take natural advantage of the different platform levels of the towers. I did not like Inklings as much as I did Ridley in my first match, and I was not able to utilize an Ultimate Smash (unfortunately). I am putting this down to my unfamiliarity with the character and the fact that I simply couldn’t soak anyone in ink before then trying to land more attacks upon them. Overall, Super Smash Bros. Ultimate is a lot of fun. While I did not see anything that truly revolutionized the franchise as a whole (the stocks, timers, basic control configuations, etc are all pretty much the same from prior entries), Nintendo is clearly trying to embrace the e-Sports world with a faster, cleaner Smash Bros. title. This was evidenced, if by nothing else, when I realized while watching other matches that there was no tripping in Super Smash Bros. Ultimate. The removal of this oft-criticized mechanic from Smash 4 means that we can finally get closer to going back to the frantic fighting that was present in Super Smash Bros. Melee. 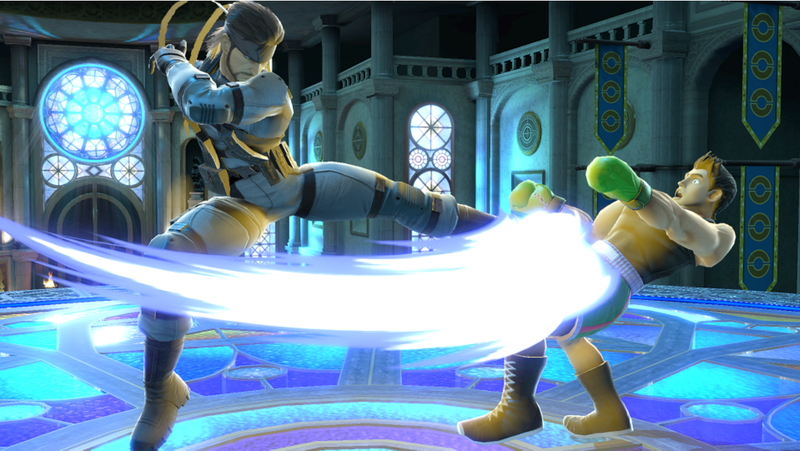 This is, to be simply put, a good thing and I cannot wait for Super Smash Bros. Ultimate to take the central stage (hopefully!) at Evolution 2019. Super Smash Bros. Ultimate is available now for preorder for the Nintendo Switch. Who do you want to fight as in Super Smash Bros. Ultimate? Do you miss the tripping mechanic? And check out the return of EOC Josh Speer’s Smashing Saturdays every week at oprainfall.